A growing number of organizations are deploying virtual desktop infrastructure (VDI), which enables them to host multiple desktops on a server hardware platform running a hypervisor. VDI comes with a number of potential benefits, including simplified desktop management, centralized desktop security, and the ability to extend access to remote and mobile users. 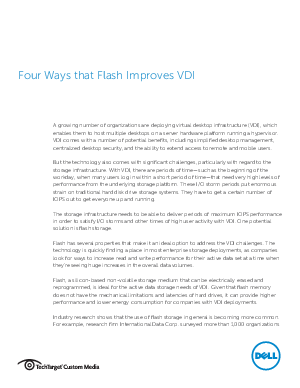 This paper explains four key ways in which flash storage can enable and improve VDI.